Fighting to be Frugal: Gimme Gimme Gimme! That's how I feel our society is. I know I've said this in the past several posts, but lately it's really getting to me more than normal. Last month I went to Costco with my inlaws. I hadn't been there in several years. I was overwhelmed with the volumes of items in massive quantities that people were buying of anything and nothing. Most of it just goes to waste. As I watched people going in and out, the carts being collected and cars being filled, all I could think of was how people were being farmed in, filled up, and farmed out as quickly as possible so that the carts could be collected for the next round to come in and get filled up. Then, today I saw this photo on facebook and it spoke loudly to me and what our society is like. I had to share it with you. 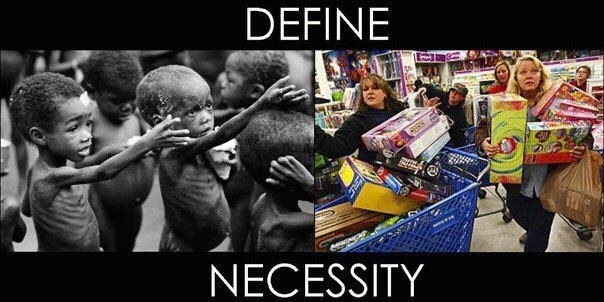 I know it's not a completely frugal stuff, but it is something to think about, especially during this season.